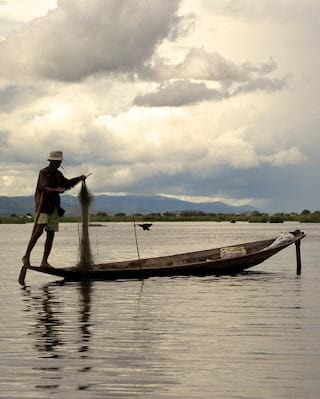 Embark on an expedition cruise along the enchanting waterways of Myanmar. Enjoy true luxury as you explore with Belmond Road to Mandalay, travelling in style to thrillingly remote realms. I CAN BARELY CATCH my breath. As the red hot-air balloon rises above the mist-shrouded canopy, the sky burns russet and the ethereal pre-dawn light begins to illuminate the myriad temples dotted below. Ahead, the golden spire of the Shwezigon pagoda is already glowing; beyond, on Bagan's dusty plains, the remains of 10,000 monuments built by kings from the ninth to the 13th centuries wait to catch the first golden rays of the day. 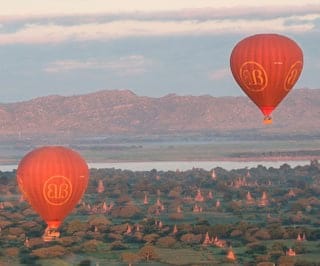 Balloons over Bagan offers an awe-inspiring perspective on the ancient capital of the former kingdom of Pagan, and it's one of the highlights for guests aboard Belmond Road to Mandalay, the colonial-inspired river cruiser named after Rudyard Kipling's poem. Gliding along the mighty Ayeyarwady, from the ancient city of Mandalay to Bagan and beyond, the vessel travels at the perfect tempo to appreciate the laid-back vibe of Myanmar's life-giving waterways and the cultural gems along the way. Aboard, guest lecturers enliven each destination. 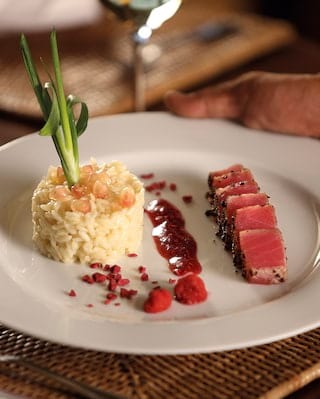 Breakfast, themed lunches and gourmet dinners combine delectable Western cuisine with local specialities, such as mohinga, a favourite aromatic fish and rice-noodle soup, and Burmese risotto with sea scallops and bok choy. The spacious cabins open out on to the river; every morning, I open the curtains and step on to my Juliet balcony to watch the riverside tableau unfurl before we set out to explore. At Nwe Nyein, our guide takes us on a walking tour of the local ceramics workshops, where artisans sculpt traditional clay pots by hand. Once glazed and fired, women stack them impossibly high on their heads and step into the street to deliver them to customers. As the cruise continues alongside forested mountains that reach down to the narrowing channel, we pass logging camps and the old colonial village of Zinbon, before dropping anchor at Bhamo, a traditional tribal meeting point; after visiting idyllic Shwe Paw island, it’s a short train journey to Naba forest station, the jumping-off point for a hike into the tangled Kachin jungle. But it is my visit to Bagan that leaves the most enduring impression. On the last evening, my pony-trap driver Mr Tin takes me across the plains once again at sunset so that I can climb up the stone tiers of Shwesandaw temple to see the stupas flush gold and bronze with the last light of the dying sun before fading into the mist.